Pennsylvania Recycling Markets Center | The Keystone of Recycling Markets Development | Experts helping industry decision makers throughout Pennsylvania. Pennsylvania Recycling Markets Center – The Keystone of Recycling Markets Development | Experts helping industry decision makers throughout Pennsylvania. WEBINAR Tuesday, March 26 – 1:30-2:45 p.m. The Pennsylvania Recycling Markets Center is a leader in developing and expanding recycling markets in Pennsylvania. The Mission of the RMC is to expand and develop more secure and robust markets for recovered (recycled) materials by helping to overcome market barriers and inefficiencies. In a competitive global marketplace, the RMC is the keystone clearinghouse of environmental, economic development, and manufacturing resources for end use support of recycled commodities and products. 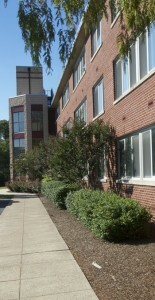 The RMC is headquartered at Penn State Harrisburg with satellite offices near Pittsburgh and Philadelphia.